Sardar Gainan Vaisov — was leader of bolgar nation. On the 2 July 1989 in the Central Park of Rest in Kazan named after Gorky on the initiative and with the money and hands of members of the club “Bolgar-al-Jadid” a tombstone to Sardar Gainan Vaisov was set up. In 1919, anniversary of Vaisov who was killed by counterrevolutions in 1918, all the Kazaners did not work. What a deep mourning it was ! Imagine only what utmost our modern “spiritual leaders’’ did so that after some decades only some ten men came to his grave. In the village Moevino of Tatarstan Green valley region from where the Vaisovs run they just started to organize the school museum dedicated to Vaisov’s family. Many generations grew up not knowing the history that had been feeding the native earth. Some years ago in Moscow died Sardar’s son – Midkhat Sardar Vaisov. Master of economy, senior scientific worker of the Institute of International Workers movement, he haunted many offices thresholds trying to publish the truth about his father. Alas! “Perestroyka” came too late to him. Howdays all the manuscripts and rare documents of Sardar’s son are held by his wife Margarita Borisovna Vaisova. She came inauguration of the tombstone memorial with her daughter Nailya. She told us that up till how her Moscow flat is visited by many people naming themselves Vaisovs. These people have been holding the deeds of their grandfathers and fathers in remembrance, some of them consciously have taken the name “Vaisov”, trying at least in such a way to hold the movement in remembrance. The Doctor of historical sciences a Kh. Khalikov who also came to the grave to show his respect said without any doubt: the people’s memorial to Sardar is not only the sign of respect but it is also the acknowledgment of the national movement at the leadership of that man. We know well the history of Russian people. But our own history was distorted because for many years historians were frightened. The truth was too dear for those who dared to tell it. D-r Khalikov and Midkhat’s wife unreeled the memorial. But who will unveil the curtain that covers “white spots” the Bolgar history is abounded in? The memorial to Sardar Vaisov was made for his native people without compensation by the painter Tagir Abdullin from Kiev. The beneath article is written by Fargart Gabdul-Khamit Nurutdin, a historian. When the Academy is shot at. Among blank spaces on the map of our history there is one covering the whole époque of our Republic national-liberation movement known as Vaisov’s movement (1862-1922). Originally appeared in the form of a peasants’ and handicraftsmen’ protest against reinforcement of capitalist, national and religious oppression, Vaisov’s movement did not recognize tsar’s power, court, taxes, state institutes, founded by the tsarist autocracy and against muftiat and the institute of appointed mullas demanded the restoration of Bolgar State, abolition of slighting Bolgars, setting up democracy and religious liberty. Practical work of Vaisov’s movement brought forward a rather effective way of fighting against the tsar’s autocracy that afterwards was used in the liberty movement of Indian people by Gandy and some other peoples of the world-namely, civil disobedience which in case of authorities violence turns into an armed revolt. Bagautdin Vaisov founded “Muslim Academy” in Kazan – it was the first in history of Russia cultural and political center of Bolgar people that embraced maktab (secondary school) and madrese (high school), a printing house, the headquarters of the movement, the so called “Holy Department”. The vaisism enlightment and liberation character caused anxiety of the tsarist autocracy and the extreme right-wing Black Hundred muslim bourgeoisie and the mutty and his assistants who flooded gendarme departments with information against vaisovites and with appeals to put an end to that pernicious doctrine”. It was the full denial by Vaisovities of the authorities jurisdiction that got particularly furious tsarism. Vaisovites, for example, introduced into practice their own passports where their subordination to Islam laws only was underlined and openly written ethnonym “Bolgar-al Bolgary (the selfnomination) that was officially ignored by the autocracy. After a number of fierce peasant rebellions excited by Vaisovites in Kazan Province in 80th of the 19th century, tsarism and Tatar nationalists together decided annihilate the Vaisov Academy in Kazan. In 1884 details of police and crowds of Tatar Black-Hundreeds surrounded Bagautdin’s Academy that was protected by a sturdy – built fence. After seven days siege and exchanges of fire with Vaisov’s fighters the chastises managed to capture by storm and smash up the citadel of the movement. The six-year old Bagautdin’s son Gainan (Gainutdin) survived by some miracle and took a shelter in the families of surrived Vaisovites. And the founder of the movement himself was thrown into a Russian prison for different minded, that is into the Kazan District Hospital for mental diseases, where he was martyred in 1893. However, tsarism could not surprise the Vaisov’s movement. Despite the fierce terror and condemning to penal servitude hundreds of peasant families, in the 90th of 19th century Vaisovites excited rebellions one by one. They showed courage both in torture – chambers and at trials. After some years the Okhranka (Secret Political Police Department in Tsarist Russia) managed to Capture the sixteen year old Gainan who was underground. According to the report of a Kazan Gendarme Department colonel Gainan came soon into collision with the goverment, even till the armed conflict and in 1894 was called to account and exiled to Siberia, in 1895 – to Sakhalin Island, from where he returned to Kazan in 1906 in virtue of the Manifesto. That was the beginning of G.Vaisov’s revolutionary career (1878 – 1918), who also was boon in Mullaile and who after his returning from exile held the post of Sardar – the leader of “Firkai Nadjia”. He restored the Muslim Academy in new settlement (Novaya Sloboda – a region of Kazan). He appeared to be so famous leader of the movement that his party rank turned into his proper name – Sardar. The position of the movement – civil disobedience turned into the boycott against the Russian autocratic government. The whole tsarist Empire was shocked by his mocrering phrase about Nikolai II : “We honor our Sovereign and we are praying for him, but we do not need his State”. In his next statement he flung to such sharp words: ”We raised our green banner with the picture of stars and a half-moon, we are fighting for our religions, national and political rights, it is a sacred war against the oppressors’ government”. In response to it the autocracy and Tatar bourgeoisie raised a new tide of vaisovites prosecution, administered justice and meted out punishments. Vaisov’s movement roused a great interest of Leo Tolstoy and his live minded person – the Russian writer I.F. Nasghivin who came especially to Kazan in 1908 to have a conversation with G.Vaisov. “In a few moments Sardar came in the passage. He was still a young man in a green striped oriental robe and a white turban. His face with dark well cut short beard and long handing down moustaches was calm and handsome; especially handsome were his big serious eyes. All his picturesque figure showed a kind of unusual specific peace and peculiar comeliness – that was the result of hard inward work at himself”,- wrote later I.F.Nasghivin about his meeting with the Vaisovites leader. With great interest Gainan made inquiries about “Great Preacher” as he called the genius of Russian culture, and told about his wish to visit L.N. Tolstoy in Yasnaya Polyana. L.N. learned about it and a friendly correspondence sprang up between him and Sardar. And on the 11th of February 1909 a following record appeared in the daybook “yasnaya polyana notices” by D.P. Makovitsky who was Leo Tolstoy’s doctor and secretary: ”By the evening came Andrey Lvovich, Vaisov…,Sergeyenko… and Chertkov… Vaisov is a Kazan Tatar, about 38 years of age, handsome, a calm face with beautiful teeth and a black beard, spectacled, pale. When sitting, he is swinging slightly from side to side. He is easy, decent but not shy. He speaks Rassian fluently, freely, though with some mistakes in his speech. L.N. said he was glad to see him and was waiting for him… L.N. remembered Kazan, that he used to study the Arabian language there at the Oriental Faculty…” Sardar had stayed in Yasnaya Polyana for three days. Leo Nikolayevich was interested in the spiritual essence of Vaisov’s movement, therefore it was quite natural that in their conversations they touched the problems of Islamic faith. And here L.N. Tolstoy showed a deep knowledge of Koran and asked Sardar about his altitude to different interpretations of Islam belief. The talks with the movement leader showed that the main point of the movement is not in reforming Islam but in deep political and social economic reorganizations of muslim society. This slightly contused Leo Nikolayevich because he thought of Vaisovites as being only the reformatory of religion but his sharp hatred to any kind of injustice made him sympathize with national and social problems of Vaisovites who were oppressed by Russian autocracy. When seeing off Sardar to Kazan where new pogroms waited for “Firkai Nadjia” L.N. Tolstoy said: “Propagate, gain and prosper, wish you that sincerely”. Friendly relations between Leo Tolstoy and G.Vaisov did not stop after the latter’s departure and continued by correspondence. The information coming to Yasnaya Polyana from Kazan was very troublesome: “The arrests of Vaisovites started, tsarist oprichniks in connection with members of Tatar Chornaya Sotnya threatened to crush the academy. The sausage seller Kildishev who was kicked out by Sardar from “Firkai Nadjia” for the attempt to enrich himself at the expense of the party fund and the learned missionary H.F.Katanov published slanderous booklets about Vaisovites movement. “My dear brother Vaisov! Your letter both made me glad and sad. I was grieved for your present hard situation, but I was more glad than sad. I was glad for the fact that from your letter I felt the fraternity with you, towards which all the peoples of faith are going and will come to the united and common for everybody law of God: love to him and to all the men without distinction. God and your faith in him help you to overcome all the difficulties of your situation. Write me please it I could serve you with anything. I would be happy to do that. In the history of our land the friendship between the great Russian writer and the leader of national movement Vaisov is one of the most exciting moments that cannot be forgotten or depreciated. A man who is against socialism is against God. The first Russian revolution sharply changed ideology of Vaisovites bringing into their originally naiv peasant ideas about the way of creating the land of Truth and Justice – the ideas of Marxism. In that period of time Sardar laid the foundation of a new outlook – Islam Socialism”, based on the conviction that the establishment of socialism and democracy through the Soviets is execution of the laws of Allah and therefore the revolutionary struggle is sanctified by the pure true Islam. This theory manifested itself in Sardar’s famous appeal to the people: “Brothers, with fortitude and steadfast faith carry out social reforms and organize soviet authorities. But it you, brothers, go against socialism, by that you will go against God.” Because of people’s liberty struggle and dissemination of Marxism among Vaisovites the points of view of Vaisovites and their movement had drawn nearer to the all –Russia proletariat revolutionary movement thus to bolshevism. But before the revolutionary seventeenth year on the 23d of October 1910 Vaisov and his party was under tsar’s trial that sentenced Sardar Vaisov to 4 years imprisonment, with the deportation in Siberia. But that did not stop a powerful advance of their movement. According to the opinions of vaisovites themselves in the period of Stolypin’s reaction 60 thousand persons took part in the movement, with 10 thousand of which being able to fight in armed conflict against tyranny. Much information was published about new and new revolts of vaisovites not only in Kazan district but also in Siberia either. The ideas the vaisovism were supported and spread beyond the russian Empire - in Turkeystan or China. The February revolution in 1917 liberated Vaisov from the Siberian exile. Sardar came back to Kazan and offered the City Committee of RSDRP(b) alliance for costruggle against people's oppressors. In april 1917 "Firkai Nadjiya" organized the first congress of Volga-Bolgar muslims in Kazan. On the first of may Chairman of the Congress a greeting telegram to Petrograd Soviet of Workers and Soldiers deputies. The Congress demanded an argent ceasing of the war and making peace without any annexation and contribution and convocation of peaceful conference of the people representatives. Then the telegram said: " To restore in the world welfare and justice for all the peoples and nationalities according to their historical circumstances ". In July 1917 Sardar sent Kerensky his famous message " Protest to Kerensky" where he mercilessly stigmatized the anti-popular and imperialistic policy of that traitor of revolution. In the October days vaisovites went together with bolsheviks to set up the Soviet power in the district. According to the J. D. Chanyshev, armed Vaisov's troops called the Green Guard took part together with the Red Guard troops in the attacks against the Sandetsky Palace. Where headquarters of the Volga region. Provisional Government armed forces took seats. After settlement of the Soviet power "Firkai Nadjia" was named as "Soviet of the Volga Bolgar muslims" and took an active part in the work of the people power organs. As a national revolutionary movement "The Soviet Volga Bolgar muslims" was in permanent connection with the Muslim Socialist Committee (MSC) headed by revolutionary-leninist Mulanur Vahitov. Thus it is not casual that the Vaisovities distinctive symbol with the picture of a star and the semi-moon became the emblem of all the Red Guard for nations of MSC. In February-March 1918, a very dangerous period for the Soviet power in Kazan district, a period of conter-revolutionary Zabulachny (that is a region of Kazan beyond the little river named Bulak) revolt of tatar bourgeois nationalist party "Milli Shuro", vaisvities against doubts rose up to defend revolutionary achievements of the people. The Bolshevik's headquarters gave 7 thousands guns for neutralization of revolt. Knowing about it on the 28 of February counter-revolutionaries organized an anti-soviet demonstration and under the shelter of a resentful crowd moved towards the headquarters of the Green Guard. The Guard was ready to repulse but Sardar who wished to stop the revolt with peaceful address to the people who were deceived by nationalists for bade shooting and stepped up towards the crowd, but as soon as he started his speech there a pistol shot of a revolver followed. The crowd smashed the Guard at once and surrounded Sardar wounded at the head. They say, that when the resented Tatar while guardists - all those shopkeepers and petty bourgeoisie men surrounded him and asked who he was Vaisov answered proudley: "I am Bolshevik", and at the same instant he was torn to pieces by the crowd". So described V.A. Tikhomirov Sardar's perish. On the 8th of March by decision of the revolutionary Headquarters of the Kazan Soviet and the Commissariat on Muslim affairs the revolutionary funeral of Vaisov took place. He was buried on the Kremlin Square near Syumbeki Tower. That day was declared as the Mourning Day for all people and the day of setting up a semi-moon on the Tower. When a parting gun volley was fired over Vaisov's grave a shawl was pulled of the Tower and all the mourning people could see the Tower in its full beauty with a semi-moon on its peak and feying green Vaisov's banner. On the 28th of February the presidium of Kazan Government Soviet resolved in commemoration of Vaisov to rename a part of Tukaevskaya Street where Vaisov was murdered into Vaisov Street. Vaisovites fulfilled Vaisov's behests: to defend Soviet power and socialism. In 1919 - 1920 they struggled under the leadership of Vaisov's brother Gasisan Vaisov against counterrevolution and white - guardians in Turkeystan, the Ukrain, in the Volga region and the Urals. 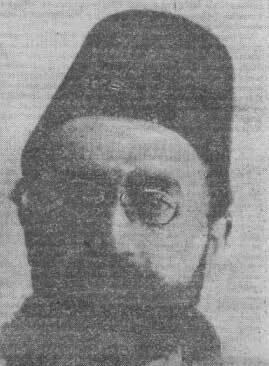 In 1920 M. V. Frunze who permitted to form Vaisov's Red Guard troops informed Moscow from Samara: "… vaisovites named themselves Volga Bolgars, thus claiming to the role of a special nation taken separately from tatars… At the same time the movement has a religious coloring, being a revolutionary socialist movement in the Islam world… It is known to have many adherents in the Chinese Turkeystan and Mesopotamia. Taking into consideration all that the Revolutionary Soviet of the Front found it possible to form one Volga Bolgar Muslim regiment both in order to use that movement and to set a control over it." "On the day of his death every worker and peasant should say will of him. No matter that Vaisov was not a communist, that he had many errors, he was a true revolutionary devoted to Soviet power who died for his solidarity whith the revolutionary party of workers and peasants. May the memory of Vaisov a protestant and revolutionary live for ever!"